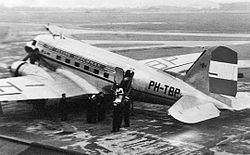 The 1947 KLM Douglas DC-3 Copenhagen accident was the crash of a KLM Royal Dutch Airlines flight from Amsterdam to Stockholm via Copenhagen on 26 January. The accident occurred shortly after the Douglas DC-3 took off from Kastrup in Denmark. All 22 passengers and crew on board were killed in the accident. Among those killed in the crash were Prince Gustaf Adolf of Sweden (at the time of his death, second in line to the Swedish throne), U.S. opera singer Grace Moore, and Danish actress Gerda Neumann. Prince Gustaf Adolf was the father of the present king of Sweden Carl XVI Gustaf. A hundred thousand people attended the funeral. Moore's body was flown to Paris on another KLM aircraft, and she was buried on 3 February 1947 with more than 500 people in attendance. The probable cause of the crash was determined to be failure to remove the gust locks that had secured the aircraft's elevators while it was parked. It was the worst aviation accident in Denmark at the time of the crash. ^ "Accident Synopsis – 1947-12". planecrashinfo.com. Retrieved 5 February 2014. ^ "Prince and opera star killed in plane crash". Ottawa Citizen. Associated Press. 24 Jan 1947. Retrieved 24 Nov 2014. ^ "Grace Moore's Body From Plane 1947". Pathé News. Retrieved 6 February 2014. ^ "Paris funeral service for Grace Moore". The Advertiser. 4 February 1947. Retrieved 6 February 2014. ^ a b "Douglas DC-3C (C-47A-30-DK) PH-TCR Kobenhavn-Kastrup Airport". Aviation Safety Network. Retrieved 5 February 2014. This page was last edited on 18 October 2018, at 18:18 (UTC).